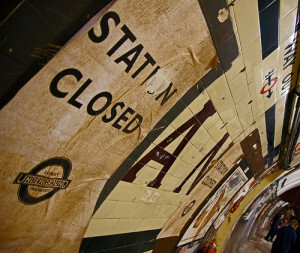 The London Transport Museum has announced a new series of tours in November at the disused Aldwych underground station. Aldwych opened to the tube-travelling public in 1907 but was never well-used, closing nearly 100 years later in 1994. The Transport Museum has organised a number of highly successful events there over the last few years to allow Londoners to explore their fascination with disused stations. The tours start on 7 November. Groups of up to 40 people will be escorted by volunteer tour guides into the ticket hall and then down to the platforms and inter-connecting walkways – including some that have very rarely been seen by the public. Given how quickly LTM's Aldwych events sell out, we suggest you get your ticket orders in soon. Tickets must be booked in advance at www.ltmuseum.co.uk or by calling 020 7565 7298. The cost is £25.00 (£20.00 concessions). All tickets include free entry to London Transport Museum to be used within one month of the stated Aldwych station tour date. For anyone who hasn't visited Aldwych before, there is no step-free access but there are 160 steps so we suggest you leave your stilettos at home. Photographers will be pleased to learn that SLR cameras are now allowed on tours of Aldwych but not tripods. Photo by CrowMDF in the Londonist Flickr pool.